Welcome back. I went back-and-forth and around the block before going with today’s blog post. It’s about dogs, which should please many readers, but dog metacognition? Nevertheless, that’s what researchers from Germany’s Max Planck Institute for the Science of Human History and Friedrich Schiller University tested. And it is interesting. Metacognition refers to the awareness and understanding of one’s own knowledge--knowing what you know and don’t know--and to one’s ability to understand, control and manipulate one’s cognitive processes. 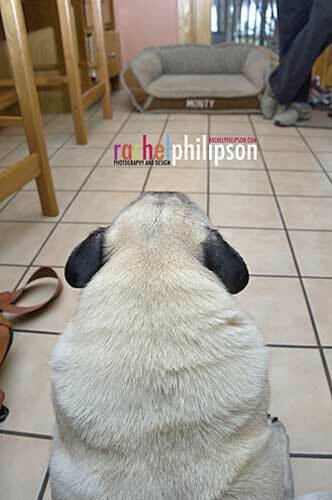 For the study I’ll review, consider metacognition to be a dog’s ability to use its prior knowledge to plan a strategy for approaching a task, take necessary steps to problem solve, reflect on and evaluate results, and possibly modify its approach. The researchers conducted three experiments to test if dogs were sensitive to the information they had or had not acquired and if they would seek additional information in situations of uncertainty. For each experiment, dogs had to find a reward placed behind one of two V-shaped fences. The two fences stood about 5 feet (1.55 meters) apart. Each had a hinge at the top of the V and a gap of about 0.8 inches (2 centimeters) at the bottom of the V.
Experimental set-up, where E1 is experimenter who places reward then sits between two V-shaped fences, each with a hinge at top and gap at bottom, and E2 is experimenter holding dog being tested (from link.springer.com/article/10.3758%2Fs13420-018-0367-5). Dogs were tested in Seen and Unseen conditions. In Seen trials, the dog saw where--behind which fence--the experimenter placed the reward; in Unseen trials, the dog did not. The research question was whether dogs would look or smell through the bottom gap in the V’s when they had not seen where the reward was placed. Checking would indicate the dogs were aware they did not know where the reward was--a metacognitive ability--and that they were after more information before choosing a fence. First Experiment: 48 dogs (26 female) of various breeds and ages were tested, with half searching for food and half searching for a favorite toy. Each dog completed 24 trials of both Seen and Unseen conditions. On average, the dogs selected the correct fence in 94% of the Seen trials and in 57% of the Unseen trials, and they checked more frequently in Unseen than in Seen trials. Their accuracy and checking were higher when rewarded with the toy, which might reflect their experience searching for a toy or that they were not as over-motivated as with food. 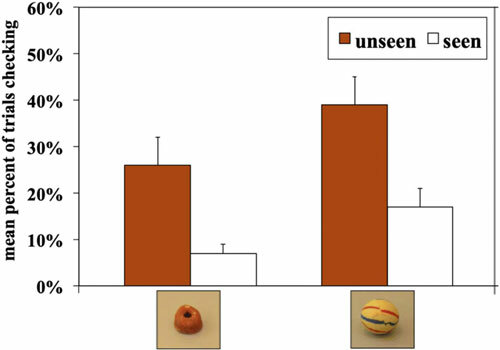 Mean percent of trials (+ or – standard error) in which dogs checked for food (left) and toy in Unseen and Seen trials in Experiment 1 (from link.springer.com/article/10.3758%2Fs13420-018-0367-5). Although the checking and searching patterns were similar to those observed with primates, dogs generally checked less and were therefore less likely to be successful in the Unseen condition, they did not learn the most effective strategy over trials, and they were not always accurate when they checked. Second Experiment: 24 different dogs (12 female) were tested in both Seen and Unseen conditions, with half searching for low-quality food (dry dogfood) and half searching for high-quality food (meat sausages). On average, the dogs selected the correct fence in 94% of the Seen trials and in 52% of the Unseen trials, and they checked more frequently in Unseen than in Seen trials. In contrast to primates, dogs’ checking response was independent of the value of the reward; food quality had no effect. Third Experiment: The general procedure was the same as in the Seen condition of the other experiments, except 25 new dogs (14 female) were tested using four different time delays (5 to 120 seconds) between showing the reward and releasing the dog. The dogs’ overall retrieval accuracy was significantly higher for shorter time delays; however, they did not check more often when the task was more difficult. 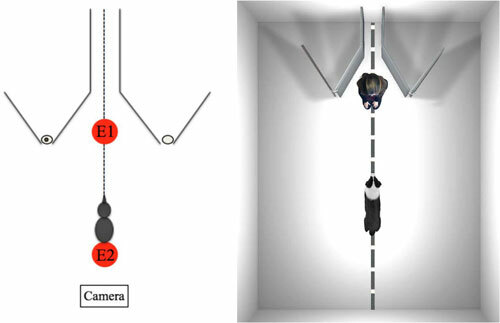 Overall, dogs adapted their searching behavior by checking for extra information in a flexible way, indicating they had access to what they had seen. That dogs checked significantly more when they had no knowledge of the reward’s location (Unseen trials) could suggest metacognitive abilities. The researchers concluded that further work was needed to determine which specific monitoring processes related to metacognition are involved. Alas, it’s another stay tuned. Of course, they could have studied cats. Thanks for stopping by.